Recently awarded Best Flight School in the Southeast, they're on their way up. They stood out, plane and simple. Around 2009, Faith Drewry and Lacey Smith showed up separately at a Tallahassee aviation event and noticed they were on the only women in the room. “And probably the only people under the age of 55,” Drewry said. They sat down together, quickly became friends and within about three years started a business, which the two pilots said has really taken off. Their FL Aviation Center flight school, at Tallahassee International Airport, boasts a fleet of six planes, a staff of 12 and a course or program for virtually every level of piloting. It also recently received regional recognition from a national pilots association. Drewry and Smith have built their business as trailblazers with altitude. Citing 2017 data, the Federal Aviation Administration reports that women make up 7 percent of pilots in the U.S. and 6.4 percent of commercial pilots in the country. 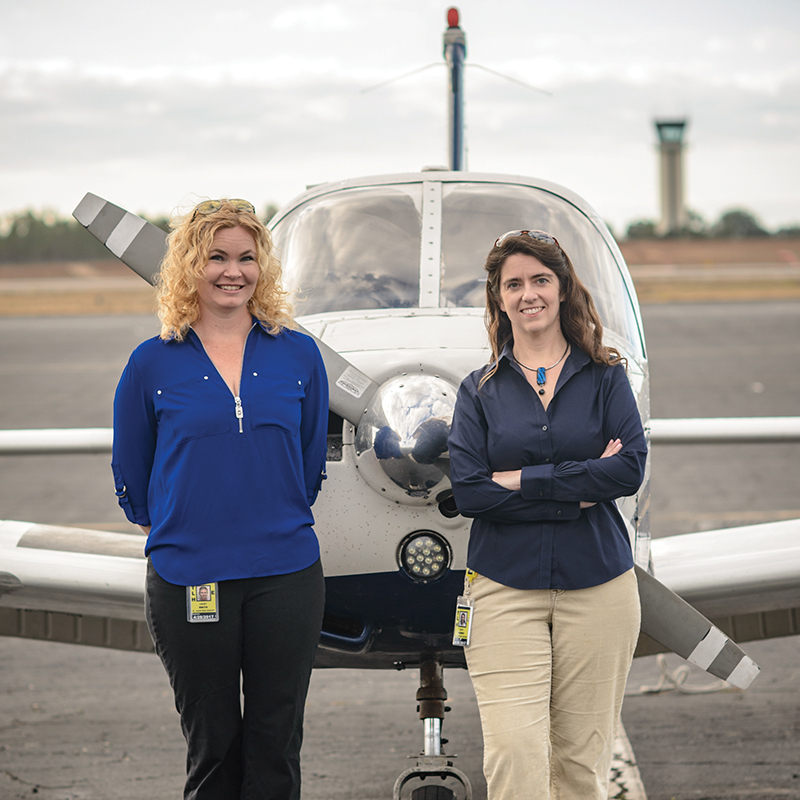 Reporting to Drewry, 40, and Smith, 39, is a team of seasoned flight instructors, all but one of them male, including one who has been a pilot since the 1960s. The company recently hired a woman instructor. “We’re just following our passion,” Drewry said. But “we’re always happy and excited to hear we’ve been lucky enough to inspire another woman to follow her dreams. FL Aviation Center offers courses and certification training toward, among other things, becoming a private pilot, a commercial pilot, a professional pilot or a flight instructor. The professional pilot program trains for private, instrument and commercial pilot’s licenses. The company also offers courses for the curious, even the nervous. A $200 “discovery flight” pledges to teach a student to “execute a perfect takeoff, with little help,” to undergo climbs, descents and turns and to “follow your instructor through a smooth landing,” the school’s website says. A “fearful flyer” course puts the student at a simulator rather than in the sky. Students include younger people pursuing a career in aviation, business owners aiming to better reach their customers and “empty nesters fulfilling a lifelong dream,” Drewry said. Drewry said her passion started early, following that of an aunt who was a pilot. She said she started flight training when she was 14 and got her pilot’s license at 19. Practicality drove Smith’s interest. As a horse trainer, she said, she pondered the time it was taking her to reach customers scattered far and wide. “I figured it would be a lot faster to get to my clients if I could just fly,” she said. When they met about 10 years ago at the Tallahassee aviation event, Drewry offered to help Smith work on getting her license as she continued her own training, Drewry said. In 2012, they decided to buy a plane, a 1974 Piper Warrior, a four-seat, four-cylinder aircraft that you might find available today for about $40,000. Within months, they started the flight school. The school boasts that it offers many of the same features of other Florida flight schools without as much congestion. Nate Soucia, 32, said he has been training at FL Aviation Center since 2016. A part-time job as a dispatcher there allows him to pursue his certification full time, he said. FL Aviation Center’s private-pilot program generally costs about $11,000 but can cost as low as $9,000, the company said. Drewry said a private pilot’s license typically requires 50 to 55 hours in an airplane with an instructor. Their company is getting attention. Based on a survey of students’ flight-training experience, the Maryland-based Aircraft Owners and Pilots Association last year awarded FL Aviation Center as Best Flight School in the Southeast. “Our goal is to be the best in the country,” Drewry said, that is, “to really raise the bar” in aviation education.